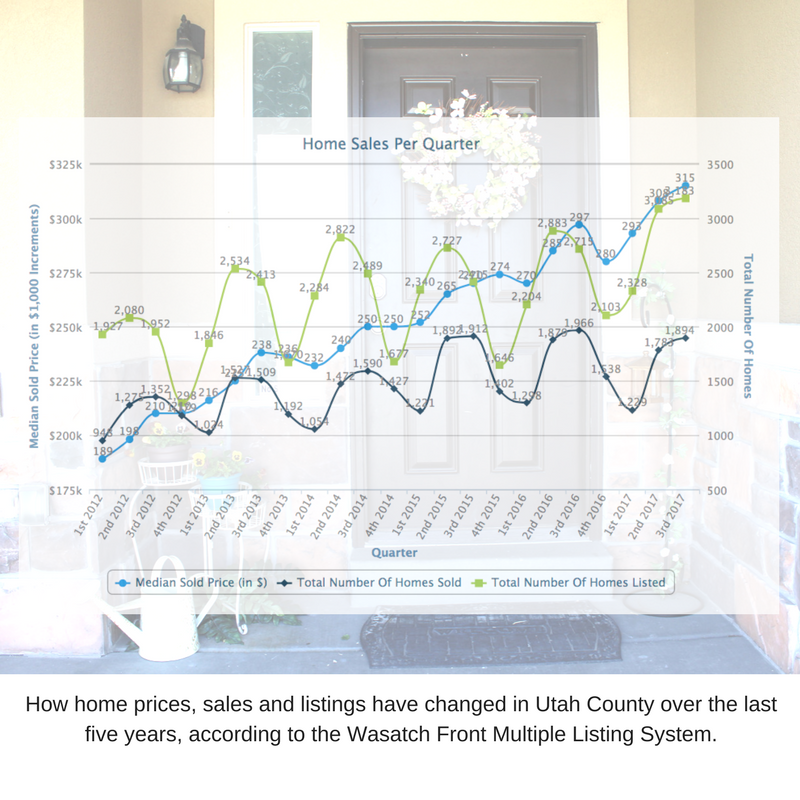 The median sales price of single-family homes in Utah County dropped slightly in October from September, but overall homes have increased over the past 12 months 6.1 percent, according to the Wasatch Front Multiple Listing Service. While the shortage of homes for sale continues, slightly more homes are on the market now than a year ago, statistics show. Over the last 12 months more than 6,400 homes were sold in Utah County for a total volume of $2.19 billion. Most sell for 99 percent of the asking price with bidding wars continuing on the hottest properties. Savvy agents are pricing their listings to encourage multiple offers — not too high, often just under the highest priced property of comparable homes. The median price of a single-family home in Utah County now stands at $301,114, up from $284,000 a year ago. Home sale prices peaked in September at $318,000, but dropped to $315,000 in October. The original median asking price over the last 12 months has risen $31,000 from $294,000 to $325,000. As of this writing, 1,827 residences are listed compared with 1,811 a year ago. Of those, 1,582 are single-family homes. With more homes on the market price increases may begin to level off. As we go into winter some homeowners may decide to wait until spring to list their homes for sale, but that may be a mistake given the current market, which has more than ample buyers now. The median number of days for a home to sell in Utah County is 24. A snapshot of the median home shows a median square footage of nearly 2,800 square feet with four bedrooms and three bathrooms priced at about $112 a square foot. In the Utah County attached home market (condominiums, townhouses and twin homes) median sales prices peaked in October at $218,000, up from $192,000 a year ago, a 14.7 percent increase. Over the past 12 months 2,466 attached homes sold with a total volume of $518.3 million. These residences are selling for asking price or more with a median original asking price of $200,865 and a median sales price of $201,712. As of this writing, 238 of these homes are currently listed. A snapshot of these residences shows a median square footage of 1,514 square feet, with three bedrooms and 2.75 baths selling in slightly more than 10 days.